Do you own the next GE? I’m talking about five dividends that are not as sacred as their shareholders mistakenly believe. We’ll review them in a minute. First, the warning signs. 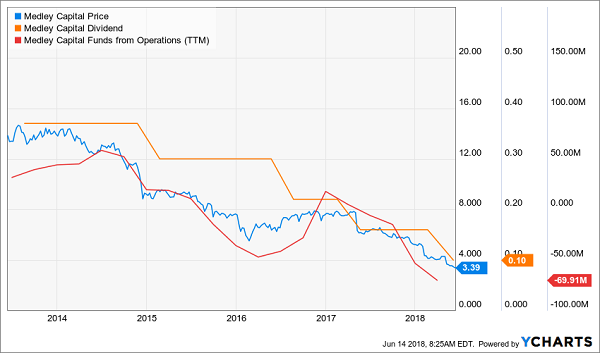 Many investors were kicked in the gut by General Electric (GE) last year, no thanks to pundits who ignored numerous red flags and encouraged people to buy GE and its historically generous yield. Sure, 5% isn’t “high,” but in a sleepy industrial like General Electric, that’s certainly attractive at a glance. It also was downright dangerous. Anyone keeping tabs on the all-important payout ratios for General Electric’s dividend had to see the writing on the wall. 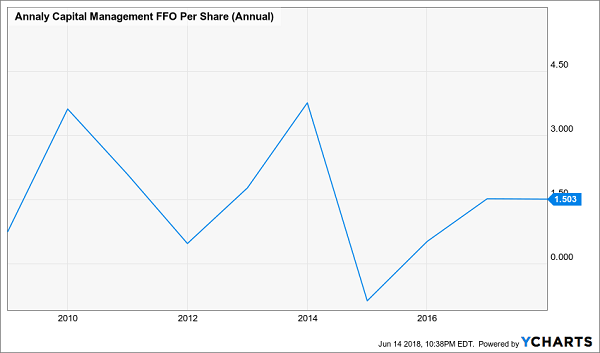 First off, its earnings payout ratio began to skyrocket in the quarters leading up to the cut, including breaking through the all-important 100% mark – in other words, it was paying out more in dividends than it was bringing in profits. But investors also would’ve seen a nasty red flag had they looked at the company’s cash situation. Namely, the company was generating increasingly less of it, and in fact started to burn it by the billions. What came next wasn’t a surprise to anyone in the know: GE drew its dividend down by half, and its shares have been quartered since then in response. 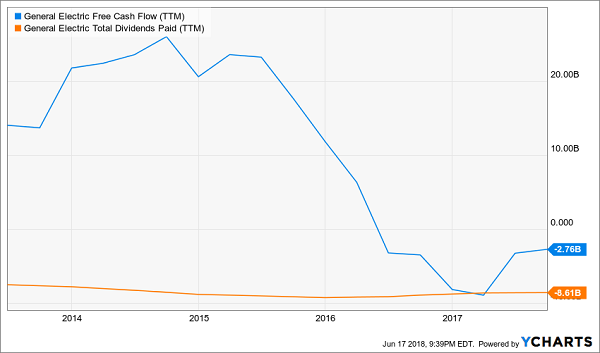 This chart has been repeated dozens of times by companies that pulled the dividend rug out from underneath their investors. Just as it’s true that stocks tend to rise alongside growing payouts, you’ll find that companies in dividend danger tend to fall before – and plenty afterward – reductions and suspensions to their quarterly payouts. Annaly Capital Management (NLY) is a mortgage REIT that invests in a number of “paper” products, from agency mortgage-back securities collaterized by residential mortgages, non-agency MBSes and commercial real estate mortgages, and also engages in middle-market lending. The good news? Annaly’s share prices have at least stabilized since their declines between 2011 and 2014. The downside? They’ve been mostly flat since then – as has the dividend – amid shoddy operational performance. 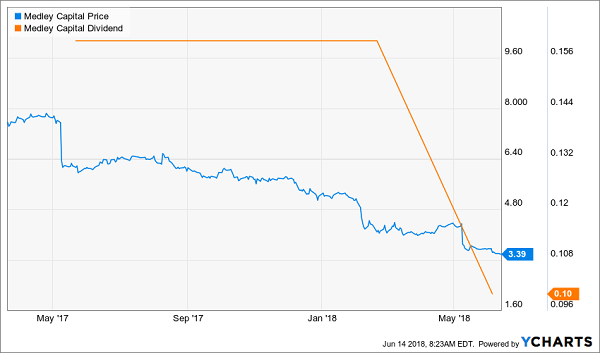 When I last analyzed Annaly Capital, I had mentioned that following the company’s switch to “core EPS,” the company posted 30-cent and 29-cent quarters that barely covered and undercovered, respectively, the company’s 30-cent dividend. It hasn’t gotten much better since then, with the company posting 30, 31 and 30 cents in its three most recent quarters. This is a long-troubled mREIT that can’t seem to do much better than treading water. And given NLY’s sensitivity to interest rates thanks to its high amount of leverage, now – after the Fed has signaled four rate hikes in 2018, instead of three – is not the time to bank on a comeback. VEREIT (VER) is a real estate investment trust that, on paper, would seem a somewhat safe play. The company owns a whopping 4,063 properties spread out among 650 tenants in 43 industries. Roughly 41% of the portfolio is retail, followed by 22% restaurants, 19% office and the rest in industrial & distribution. Simply put, struggles in one area should be hoisted up by success in another. That hasn’t really been the case, however. First off, a quick history reminder that VEREIT is the rebranded name of American Realty Capital – itself also a diversified single-tenant, net-lease REIT. However, an accounting scandal obliterated the stock and forced the company to wipe the slate clean, and that means a new name. While VEREIT has had a more honest life since it adopted its new moniker in 2015, its operational performance could use a bit of accounting shenanigans. I mentioned earlier this year that the company was building an impressive streak of quarterly AFFO/share declines. Well, that was finally interrupted in Q4 … but by a performance that was still just flat year-over-year, before returning to a small dip in Q1, no less. Among the REIT’s problems is a 6.5% exposure – its largest by almost double – to the troubled Red Lobster name. Somehow the fallout from the American Realty Capital debacle continues to trip the company up, too, with the company agreeing just days ago to pay out $90 million to settle a 2016 lawsuit by Vanguard Group. There are plenty more cases to go; one analysis puts total costs from that as well as all remaining settlements around $690 million. That’s a sizable weight around this REIT’s neck. Newspapers and even television companies are running into a wall when it comes to advertising. Digital ads placed online are targeted and precise, able to home in on a specific demographic with customized messages so the company can get exactly who they want to get. That’s an enormous problem for newspapers, which have been hemorrhaging business not just because of declining readership, but because of its clunky ads that offer virtually no targeting abilities whatsoever. It’s also an issue for TV, which offers a bit more accuracy via demographics numbers for its stations, but still nowhere near the precision that the internet can provide. It’s also a problem for operators such as Outfront Media (OUT), a REIT that is responsible for more than 400,000 digital and “static” displays across the country, including ubiquitous electronic billboards in Times Square. The company also boasts a display presence in mass-transit systems. Yes, these types of displays likely catch a few of the eyes that they’re meant to, but compared to what the internet provides, they’re highly inefficient – it’s an aerial bombardment, whereas the web is a laser-guided missile. 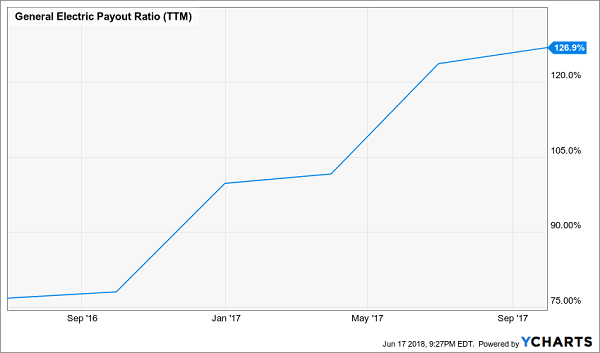 Outfront’s dividend isn’t an immediate danger; $1.99 in adjusted funds from operation (AFFO) over the past year is more than enough to cover the $1.44 in dividends it paid out. In fact, the company raised its dividend at the start of 2017 after a couple years of stagnation … though it’s also worth noting that OUT didn’t up it again to begin 2018. But Outfront’s yield has crossed the 7% threshold thanks to a roughly 15% decline over the past year. That’s the concern. This stock looks like dead money in this new reality. 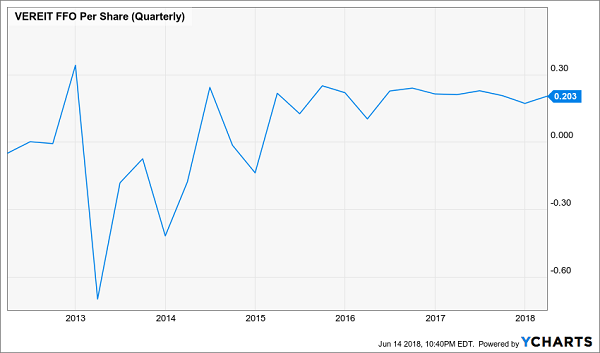 Revenues and AFFO have completely leveled off … and in fact, AFFO has actually declined in three of the past four quarters. Time bomb? Not necessarily. A weight around your portfolio’s neck? Yes. As a quick refresher: Medley Capital is a BDC whose portfolio is primarily invested in first- and second-lien secured loans across a very diversified swath of sectors and industries. But that diversification hasn’t meant squat for Medley over the past few years. The only thing that has hemorrhaged more quickly than MCC’s funds from operations is its share price. 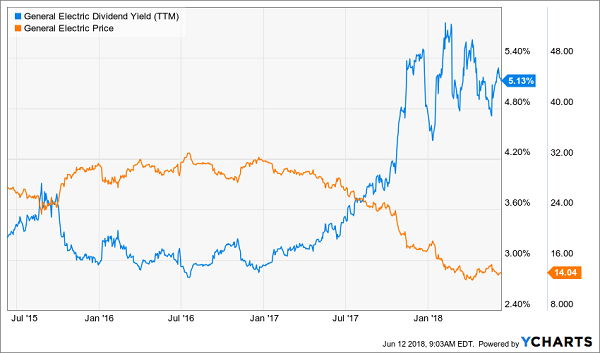 In fact, the stock plunged so fast that it outpaced declining assets and caused a stark discount to NAV that, combined with a sweet yield, made Medley seem (on its face) to be a screaming deal just more than a year ago. My deeper dig showed otherwise, and shares have in fact plummeted 55%. Worse still, the company cut its dividend again, this time from 16 cents per share to just a dime. In fact, MCC has slashed payouts four times in the past four years, leading to an incredible chart that shows just how entwined declining dividends are to declining share prices. Is There an “Aristocrats” for Dividend Cutters? Medley wasn’t a bargain then, and it’s not one now. Be careful. 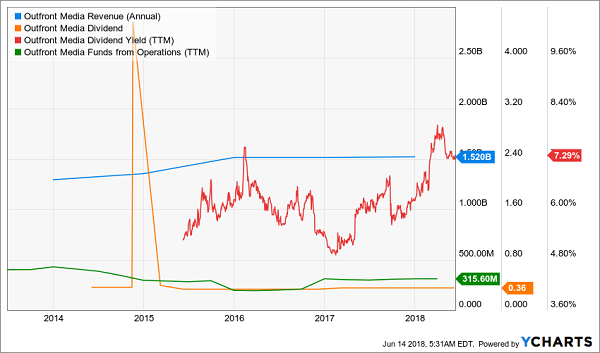 So, what meaningful yields can you trust right now? While the likes of Annaly Capital and Outfront Media might steer your retirement into a brick wall, I actually think right now is a fantastic time to buy REITs. That’s because several real estate operators offer double the yields of traditional blue-chip buy-and-hold dividend plays … and thanks to a hawkish Federal Reserve, they’re trading at juicy discounts right now! Here’s a little math you need to know as you look ahead to your retirement: You can bank about 4% in annual total returns (that’s dividends AND share price movement) from traditional slow- or no-growth blue-chip stocks. That means even if you’ve saved up half a million dollars by the time you retire, you’ll only generate $20,000 in investment income! Forget about a vacation home – you’ll be lucky to clear the bills with that paltry annual payout! Low cash flow like that will force you to claw away at your nest egg year after year just to make ends meet. And every time you do that, you slash your annual income potential, which means you’ll have to sell off even more the following year! It’s a vicious cycle that practically guarantees you’ll outlive your money. But you can avoid that cycle by looking away from slow-growth blue chips and high-yield land mines, and running toward the picks in my “8% No Withdrawal Portfolio”! This high-yield, retirement-focused portfolio features a number of income dynamos, not the least of which are a few REIT picks that not only offer more than double the dividends of the trio we just mentioned, but also the potential for 25%-plus upside thanks to their bargain valuations! I can’t overstate how important all that extra income is to the quality of your retirement years. Every additional dollar in annual income is another dollar you don’t have to take out of your portfolio – which means it can sit around generating dividends and growing your nest egg so it’s there when you really need it. There’s no reason to overpay for so-so income plays when a few true bargains with substantial payouts are ripe for the picking. You’ve busted your hump for the retirement you deserve – so invest in the companies that will ensure you get there. Click here to get my free “8% No Withdrawal Portfolio” and four FREE special reports – complete with names, tickers and buy prices!